Radio control combat flight is a huge sport these days. You might be tempted to think that it is a late-comer to the model airplane sport realm, but if so, you'd be wrong. 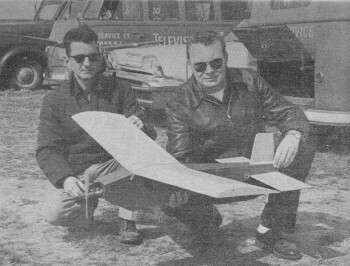 Here is an article from the December 1959 American Modeler magazine that describes the successful effort of modelers half a century ago pioneering R/C combat. Those were the days of heavy, tube-based airborne receivers and servos / escapements / reeds (crude though they were). 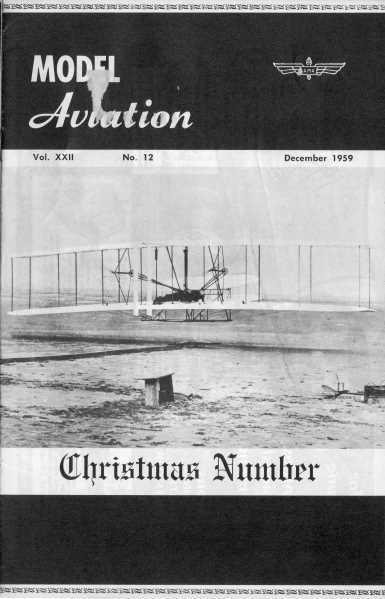 Per author H. Donald Brown, "With us, mid-air crashes have out-numbered cut steamers but the damage minor in most eases." The more things change, the more they stay the same. After having given serious consideration to flying radio-control combat and thinking of the possible consequences with anything like a six foot airplane and T.T.P.W. or reed equipment, it seemed a lot wiser to design an outfit specially for this purpose. Charles Mogee and H. Donald Brown (right) with original Wreck." Don operates a N.J. TV and appliance store. Full size plans for Ramblin' Wreck are on Group Plan # 1259 from Hobby Helpers, 770 Hunts Point Ave., New York 59, N.Y. (60c). Photo below shows model on field box; portable tool box-work bench combo keeps expensive R/C equipment out of the dirt. When considering a control setup, our minds naturally slid into a familiar, well­worn groove - galloping ghost, or as we prefer to call it, the "Crank" system. This project also presented an opportunity to design a force set-up to specially favor the "Cranks" peculiarities The craft must have snappy action with" a minimum of control surface, particularly elevator. This will eliminate the characteristic gallop and will reduce actuator current and air loads. 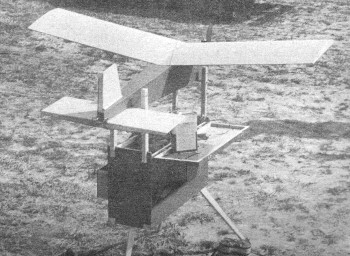 The resultant airplane is not very pretty but it is a good flyer and will take plenty of punishment due to its simplicity and lack of complication. 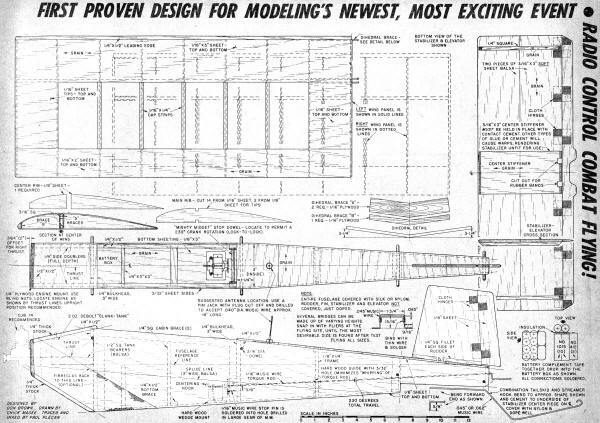 Chick Magee collaborated in building the first pair of planes and drew the plans which have been used by local modelers to turn out a number of similar planes including a biplane and some very pretty "cleaned-up" jobs. 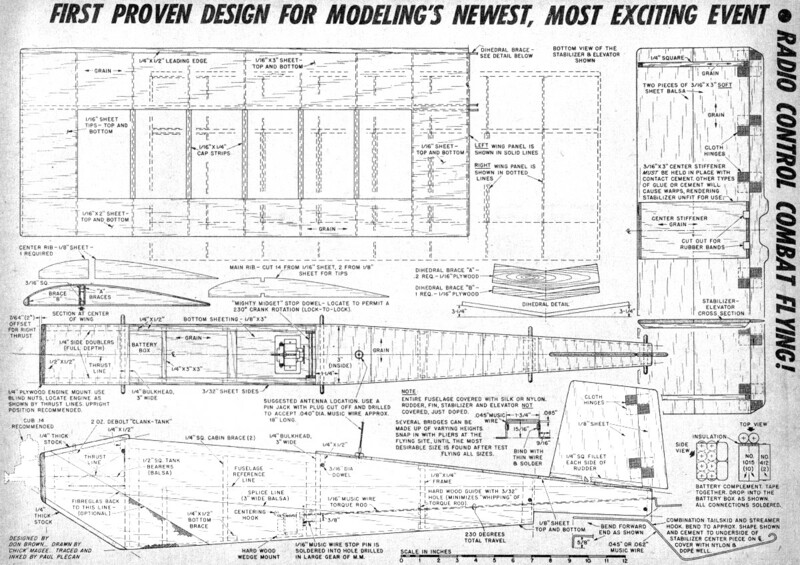 Construction is very simple with a minimum of cutting; as you will note fuselage lines have been extended on the plans. 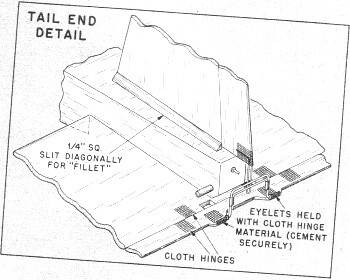 This eliminates measuring and tracing parts. Just lay balsa over the plans and using a straight edge, draw from extension lines. At the same time, mark locations of the fuselage bulkheads. Bottom planking is cut to size with its grain lengthwise, the fuselage built right on top of it - double glue all joints. Cover wing and fuselage with nylon or silk. Do not cover stabilizer or rudder; use balsa filler on them and as few coats of dope as practical for an adequate finish. Keep weight down in the tail section. A landing gear' may be employed but it increases the tendency for the planes to "lock horns" in any possible mid-air collision. Landings are smoother without any gear as the ship will not nose over. If you fly on a paved runway, it might be well to fiberglass the nose section as indicated on plans. A nylon propeller will last many flights. Combat sessions are crowd pleasers and also an education in depth perception. With us, mid-air crashes have out-numbered cut steamers but the damage minor in most eases. Anyway, this will not daunt the spirits of the of the true enthusiast! When you get the wreckage home, it does sometimes seem that it's not worth the mess, but once indoctrinated, you will rebuild and try it again, Incidentally, with the radio mounted in foam rubber, we have never suffered any radio damage in a crash. The ground control unit used by our group is the original Walt Good pulser with the following modifications: coupling condensers changed to .47 mfd. and B plus voltage to 67.5 volts. This will bring the slow ("up" elevator) pulse rate out at about 140 per minute. Down rate will then be okay. Use a geared control box of the special 60 degree "post" sold by Ace. There are kits on the market for similar ground control units. The "Simple Simul" unit was developed by John Worth. During construction, keep in mind that weight is an all-important factor. We have build combats weighing more with wider fuselages and heavy equipment. All have been a deterrent to flying ability. The originals are capable of 10 foot radius pylon turns, prolonged inverted runs, and dragging the field at 3 foot altitudes. A heavy airplane just will not perform this well. Additional data appears on the full size plans from Hobby Helpers.